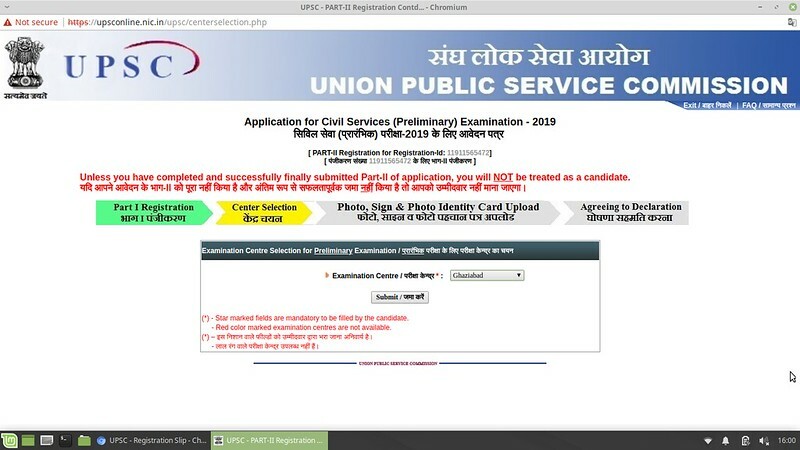 UPSC IAS/ Civil Services Application Form 2019 – Union Public Service Commission (UPSC) has released the notice for the Fictitious Fee. The notice contains the name of the candidates for whom, the confirmation from the bank has not been received. 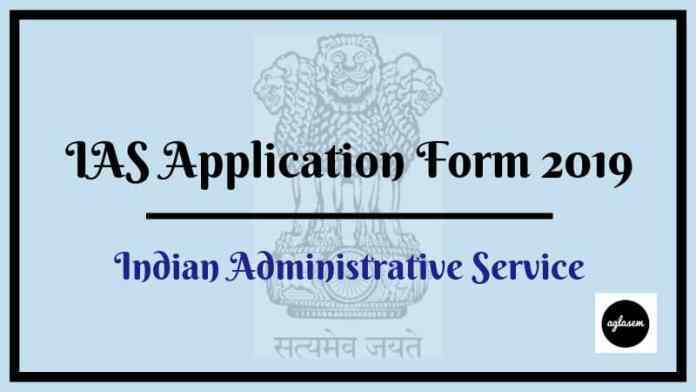 The UPSC IAS/ Civil Services Application Form 2019 were filled from February 19 to March 19, 2019, at upsc.gov.in. The application fee was Rs. 100/- for UPSC IAS/ Civil Services Application Form 2019 for unreserved category candidate. The candidates can check all the details of UPSC IAS/ Civil Services Application Form 2019 from this page. Latest: UPSC released fictitious fee notice for those candidates whose confirmation has not been received from the bank. Scroll down to check the notice. The UPSC Civil Services exam will be open for registration. Candidates who will register for the examination must make sure that they fulfill the basic eligibility criteria. The candidates must be an Indian citizen. The eligible candidates can start registering online after UPSC releases the official notification. Fictitious Fee Notice: Click here to check the Fictitious Fee notice for UPSC Civil Services Application Form 2019. Apply Online: Click here to fill the UPSC IAS Application Form 2019. The candidates looking forward to giving the UPSE Civil Services examinations have to pay the application fee in order to fill the application form. Candidates must note that the application fee once paid will not be refunded. The UPSC provides two modes to pay the application fee i.e. Online and Offline. The candidates can sue the Debit card/ Credit Card/ Net Banking details to remit the application fee. The application fee for the UPSC IAS 2019 examination can also be paid offline. For paying the offline fee the candidates have to generate the pay in the slip while filling the art II of the application form. The candidates have to upload some documents while filling the application form of UPSC IAS 2019. So it is a good idea to gather all those documents in advance, that will help. 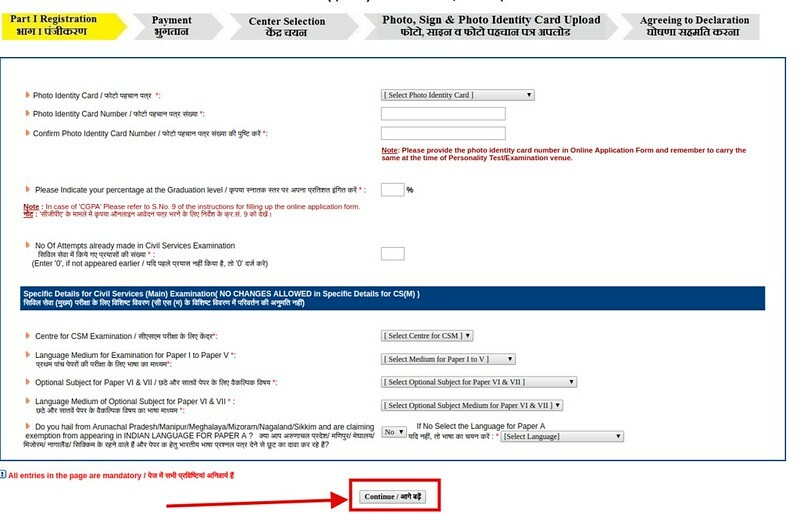 How To Fill UPSC IAS/ Civil Services Application Form 2019? The candidates who are filling the UPSC IAS Application Form should understand the entire process. For the ease of candidates, we have described the steps here briefly. There are two parts in the application form Part I registration and part II registration. At first, the candidates have to fill the registration part I. For this the candidates have to click on the above link. The link redirects to the page of UPSC. Now the candidates have to click on the first link says “Click here for Part I”. 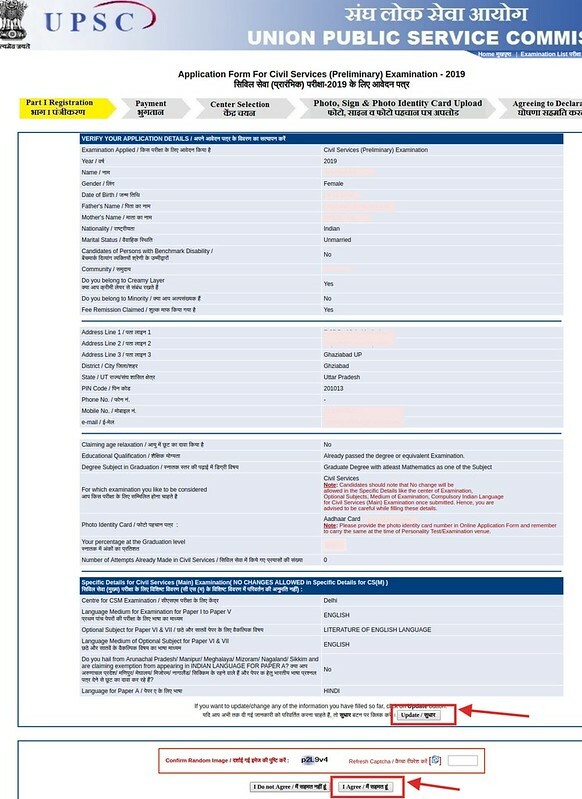 Now the instruction page appears, here the candidates have to click on yes. On proceeding the first steps of Part I registration starts i.e. registering yourself for the exam. The candidates have to choose the Examination name in which they want to appear Civil Service, IFS, and Civil Services & IFS. Once you fill the form the candidates have to submit the form. On Submitting the form the candidates will have the next option to choose whether they want relaxation in upper age limit or not. On submitting the above details the confirmation form will be shown to the candidates. Here the candidates have the option to update their form. After this, they can’t edit their form. After agreeing to the declaration the registration slip will be generated. The candidates have to print for future purpose. Step 1 Payment: The candidates have to pay the application form in any mode whichever suits them. Step 2 Center Selection: The candidates have to select the center for the preliminary examination. Step 3 Photo Sign & Photo identity card: In this section, the candidates have to upload the photograph signature and document of identity. While filling the IAS 2019 application form the candidates should have utmost care. 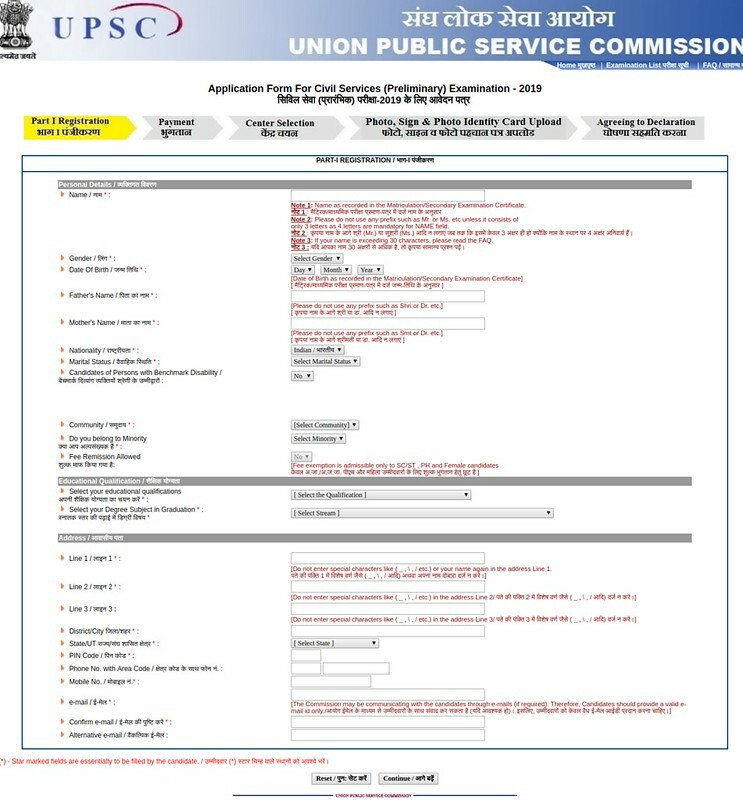 UPSC will not provide any chance to edit the application form. the candidates have to fill the application form correctly in one go. Here are some instructions that need to be followed by the IAS 2019 aspirants. The candidates are advised to provide the valid and active email address and mobile number, sice UPSC will communicate to the candidates on their registered mobile number and email id. The candidates should avoid multiple application forms, this could create confusion for the candidate itself. However, UPSC will treat the latest filled form as the final one. The most imporatnt process is to upload the documents. The candidates should upload the correct documents, the photograph of the candidates should not be blurred. The candidates who are suffering from any disability or muscle deformity/cerebral palsy have to submit the medical certificate from a Government hospital/Medical board. It is mandatory to fill both parts of the application form, filling only one form is not sufficient. The IAS Application Form is incomplete without part II. Once the application process will be over, the Union Public Service Commission will issue the admit card for the preliminary examination. The admit card will be issued at upsc.gov.in. The candidates who will fill the form in online mode will be issued the admit card of Civil Services preliminary examination. The candidates will have to enter the roll number/ registration id and date of birth to download their admit card. For the main exam and personality test, the admit card will be released separately. By giving the written examination (Prelims + Main) and interview conducted by the Union Public Service Commission. In rare cases, they could be directly selected from the non-state civil service. The easiest and direct way is to sit for the examination conducted by UPSC. The candidates have to qualify all three stages of recruitment. UPSC conducted this examination every year by releasing the notification on its website at upsc.gov.in in the month of February. Prelims are conducted in June, and Main in September. Every year approximately 700 – 800 vacancies are introduced for Group A and B services. The candidates have various question in their mind about IAS/ Civil Services. We have tried to answer their question in this section. Ques: What is the qualification of UPSC IAS/ Civil Services 2019? Ans: The candidates who wish to appear in the Civil Services examination must have a graduation degree in any discipline. The candidates who are in their final year can also apply. Ques: What are the age limit and a number of attempts for Civil Services? Ans: For Civil Services examination any Indian nationals in the age group of 21 to 32 years can apply. The candidate should note that UPSC restricts the attempts in the exam. Generally, 06 attempts are permissible for general category candidates. However, the reserved category candidates get relaxation here. The candidates should note that attempting preliminary examination will be treated an attempt irrespective of success and failure. Ques: Is there any negative for bad handwriting in the Civil Services Examination? Ans: Yes, the main exam is conventional descriptive type examination. The candidates have to write their answer. UPSC has prescribed that, if the candidates’ writing will not be legible then there will be a 5% deduction of marks. Ques: Can a person with a tattoo be an IAS Officer? Ans: As per the official notification of Civil Servies, there is no physical standard that a person with tattoo can’t participate in the examination. So a person with a tattoo can be an IAS Officer. In order to apply for IAS 2019 the candidates must be between 21 to 32 years. There is no way to correct the mistakes in application form of Civil Services if once submitted. All corrections are permissible in the registration process only. The candidates must be between 21 to 32 years.